Gaodetec is one leading slurry pump in China. 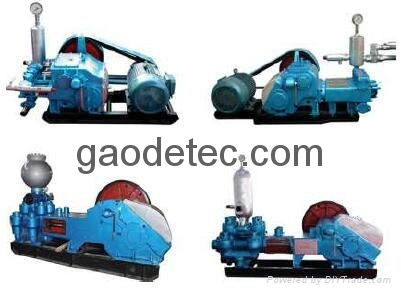 Gaodetec has ten types slurry pump for option. According to engine difference, Gaodetec slurry pump has electric motor drive, diesel engine drive, hydraulic motor drive for option. According to the flow and pressure difference, Gaodetec slurry pump have high pressure low flow and low pressure big flow for option. Gaodetec slurry pump flow from 100L/min to 1500L/min even more bigger, the slurry pump could work with drilling machine or drilling rig used in mine, geological drilling, coal mine, railway, high speed way, water conservancy and hydropower, bridge, high building, ground stabilization etc. projects. 1. What’s the project will you use the slurry pump do? 2. What’s the flow and pressure do you want? 3. Regards the engine, would you like the mud pump with electric motor or diesel engine or hydraulic motor? If electric motor, what’s the voltage in your local, 3 phase, 380v, 50HZ or other? Please send email to info@gaodetec.com or call or send message through whatsapp viber wechat etc. to +86-15903613994 for China first slurry pump supplier.